This item is a Lummer-Brodhun Photometer. This Photometer consists of a metal box with two entrances and an eyepiece as well as a slot which allows a white magnesium carbonate disk to be mounted between the two entrances. 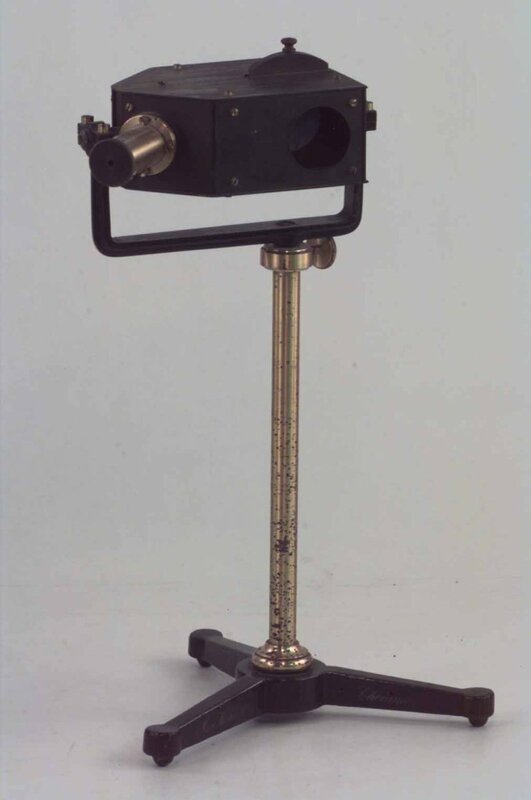 Similar to the Weber Photometer this item was designed to compare the brightness of an unknown light source to the brightness of a standard light source. Light from each of the two sources enters through its respective entrance and illuminates one side of the white disk. The light that is reflected off each side of the disk is directed through a right angled prism and towards a Lummer-Brodhun cube. This cube directs the light rays coming from both sides of the disk into the eyepiece so that the user can observe the light from both sources simultaneously. A Lummer-Brodhun cube is made up of two right-angled prisms that are placed with their hypotenuse sides together to form a cube. One prism’s side is shaped to form a convex lens, so that the prisms only touch in the very center. Where the prisms do not touch, total internal reflection occurs. Where they do, all the light is transmitted to the other side. The observer can then see a circular disc of light from one source, surrounded by an halo from the other. By matching the brightnesses of the two, the observer can use the known luminosity of one source and the distances to both sources to calculate the luminosity of the unknown source. By adjusting the distance to the sources the user could make the two circles equally bright and then use the equation L1/d1^2 = L2/d2^2 to calculate the luminosity of the unknown source. Otto Lummer and Eugen Brodhun of the Physikalisch-Technische Reichsanstalt (the Physical and Technical Institute of the German Empire, but known today as the Physikalisch-Technisch Bundesanstalt) developed this instrument in 1889.